To Dog With Love: Monday Mischief: No Pets, No Problem! Monday Mischief: No Pets, No Problem! In the spirit of Mischief Monday, this weekend we found a way to both get INTO mischief and stay OUT of mischief at the same time! ... And all while getting a little exercise AND enjoying some nice artwork. Here's how we did it. Lot of our festivals in Atlanta don't allow pets. While we hate that rule, we also don't want to see pets getting stepped on or getting overheated, so if it's for the safety of our pets, we can live with that. 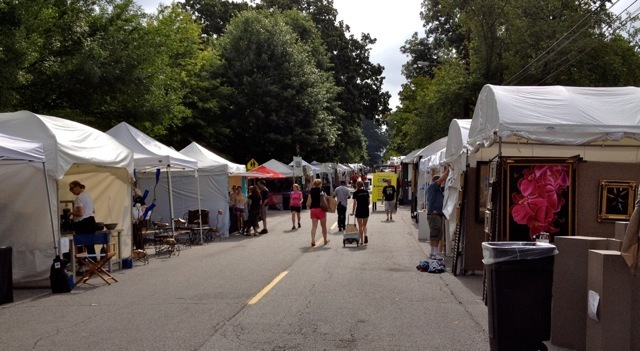 So this weekend, Rocco and I headed out on a walk to Virginia-Highland Summerfest, a yearly art and music festival located near our neighborhood. The trick is to get there early, about an hour before the festival officially starts. That way, you can bring your dog, avoid the crowds and the heat, and still see plenty of artwork. 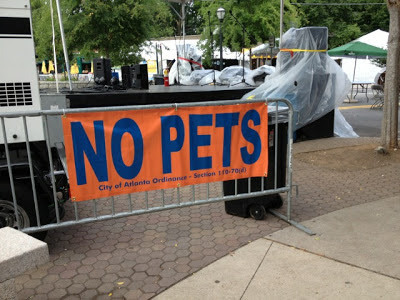 I think that's a great strategy for any festival, even if they allow pets! Coming early also means you might get more time to chat with some of the exhibitors. 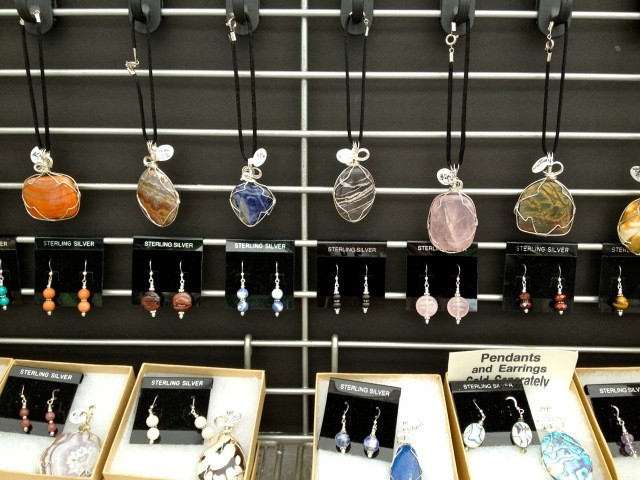 Linda Ingle and Jean Stephens, with their sweet 17-year-old poodle, are the creators of Song Dog studios, a lovely line of jewelry made with a variety of natural stones. 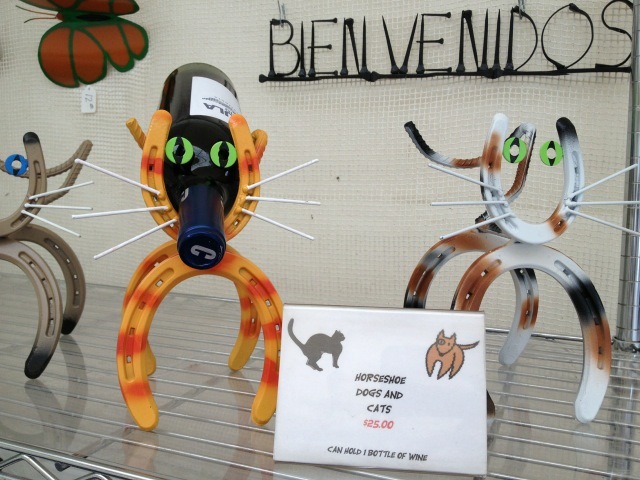 We also loved these cat and dog wine bottle holders made from horseshoes from Metal Creations. So cute! Funny how so many booths either had a pet theme or a "pet" name. 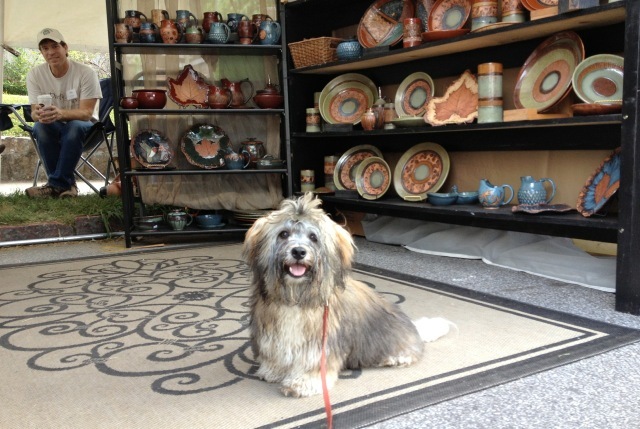 Below, Rocco checks out the Dirty Dog Pottery booth, filled with unique works of functional art and beautiful bowls that Rocco was certain contained treats of some sort. 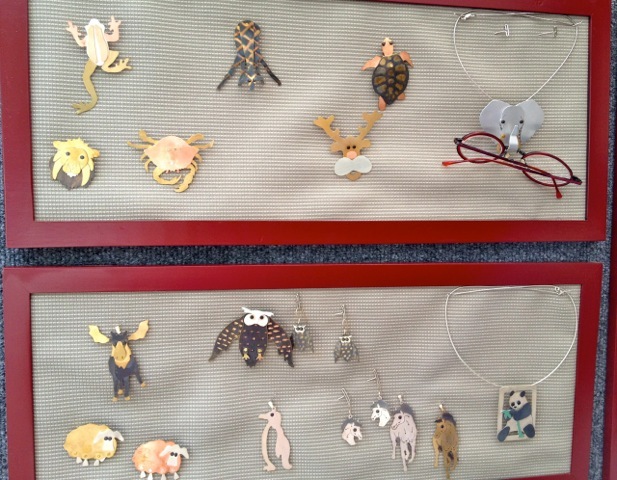 Another favorite we've seen at many shows is Anita Edwards and her adorable handcrafted sterling, copper and brass animal shaped jewelry. 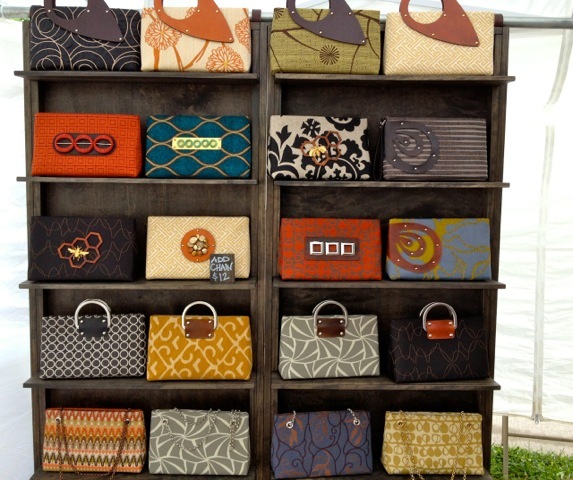 One more of our favorites are the amazing handbags from Add Libb Designs. I think we need a few of these! Getting to the show early turned out to be a great strategy. We avoided the crazy crowds and the heat of the day and still enjoyed the show. 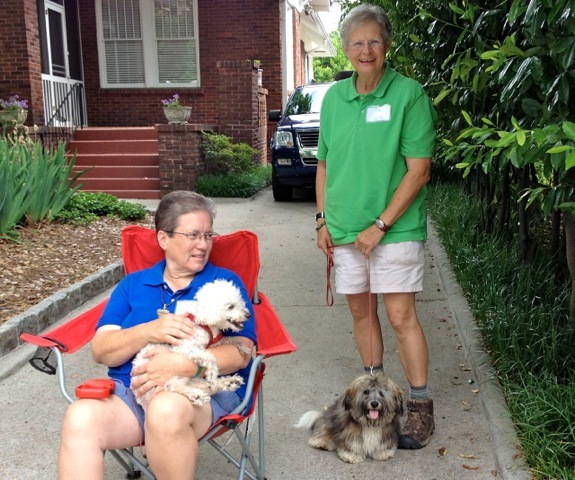 We also put in a four-mile walk, with a few rest stops along the way! Remember as the summer heats up, be careful to avoid overheating your pup. We like to walk early or late to take advantage of cooler temperatures. Now let's see what mischief everyone else is up to! Those are some cool exhibit booths!! Glad you got to go and have fun! Me too! 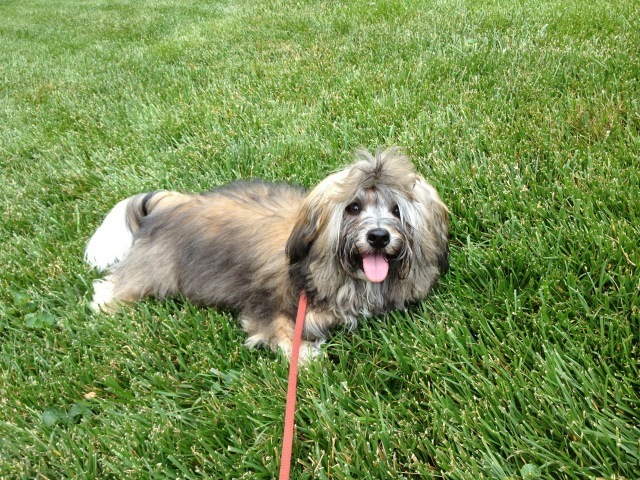 It was fun having Rocco with me, and everyone stops to talk to us when he comes along! what a sneaky, er um, good idea to get around the no pets rule! we'll have to remember that one. Great strategy. Looks like you had the best of the day with the cooler morning weather and no crowds. We walk late morning to midday to get the most of the warm weather at is not hot enough over here to worry about. Have a terrific Tuesday. What a great idea! Looks like you really got to enjoy it too without all the crowds and meet some nice peeps too! what fun! We do the same thing, we go to those events EARLY in the day, before the crowds AND the heat! Love the merchandise that you showcased! That festival looked like fun! Excellent advice about going early. I will keep that in mind! Going early is always the best for people and pets...avoid the crowds and take it all in without all the stress! Lots of cool stuff! I'm glad you were able to go, Rocco. 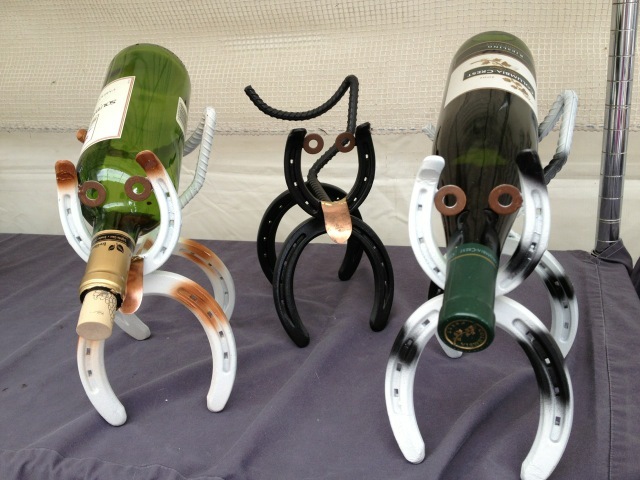 I love the horseshoe wine bottle holders and the brass animal jewelry. Nice!!! 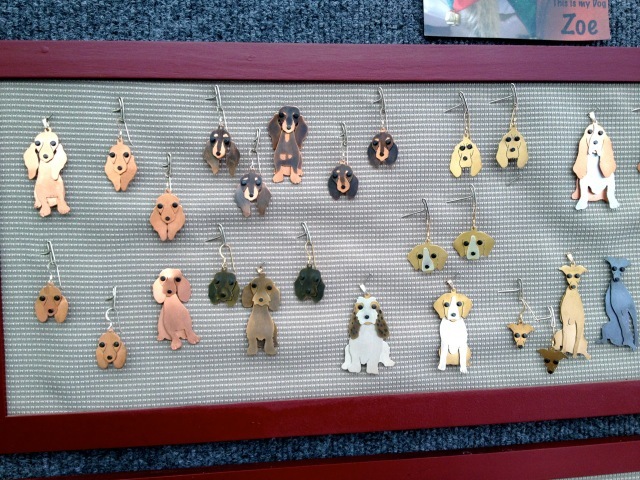 LOVE the horseshoe dogs and cats! Thanks for sharing. Sounds like a wonderful outing! And loads of cool stuff, too! In other words, you'll have to take what you learn from your pet and consistently apply these "life changing concepts" until they form the basis of your DMO in all areas of your life and become part of you. Do check these out as well. Many pet owners think of their pet as a special member of their family. Due to the closeness that exists between pets and their owners, it is especially upsetting when the animal becomes lost. However, because these critters love to explore and have adventure, don't immediately despair the loss of your family Cat and Cats. With the right information and action, you can be united with your lost pet and bring it home to safety. So we help to answer the question, how do I find a lost pet? Its clear that renters enjoy bringing their furry friends on vacation, and accepting cat carrier at your vacation rental could significantly increase your bookings. Make sure you consider these items in your pet policy. Having Cat names in the house is not easy; one has to do great effort in maintaining their good health. For this, it is important to bring some good quality pet products to keep them safe and happy. We want non-dog-people to live and let live and all that rot. We want you to be sympathetic and forgiving when our dogs hang about your gardens and enjoy their nicely prepared snacks.